Posted on February 25, 2016 . No comment. My main reason for visiting Iwate is to visit inspiring and filming location for Amachan. The NHK morning drama (Asadora) about female diver turned famous idol. 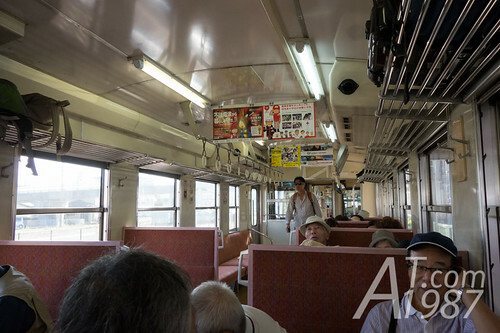 I began my Amachan location trip by getting on a Sanriku Tetsudo train to Kuji where is a main film location. Kita-Rias Line I used to Kuji. Sanriku Tetsudo (or Santetsu in short.) is a company who operate the first Third Sector railway line that used to be owned by Japan National Raiways (JNR) in Japan. 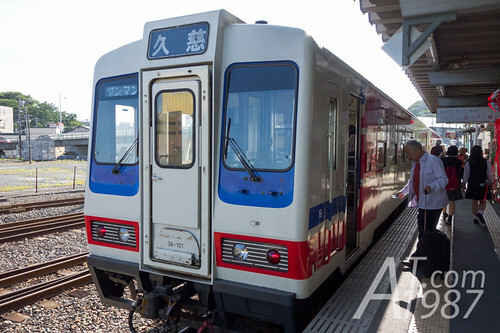 Santetsu operates 2 railway lines: Kita-Rias which runs between Miyako and Kuji and Minami-Rias which runs between Sakari and Kamaishi. 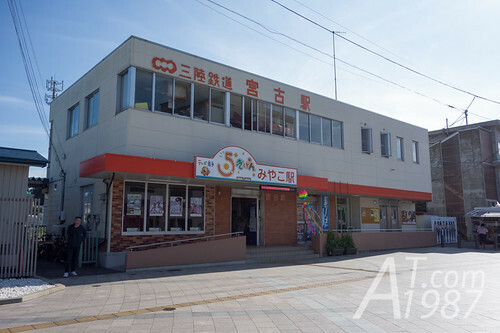 Kitasanriku Tetsudo (or Kitatetsu in short,) in Amachan is based on this company and Kita-Rias line. Their trains are also used as filming locations. After I returned a bicycle and took the bag I deposited at JR station in the last post. I walked to Santetsu station nearby. 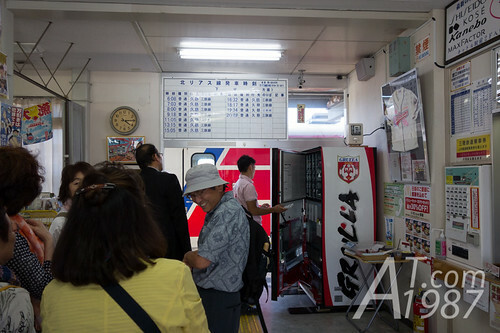 Inside station isn’t large so it’s very crowd at the train departure time. Some of them were tourists who came back from Jodogahama Beach where I rode bicycle to in the last post. 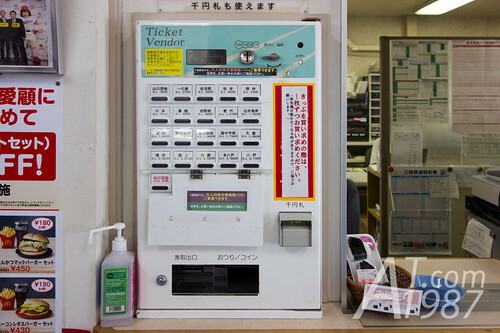 A ticket can be bought from the vendor machine at the counter. Just put the money enough for the fare and choose the station you want to get off. Kuji Station where I want to get off is written in Kanji as 久慈. (Fifth button on the third row.) The price is 1,850 yen. Because Sanriku Tetsuo doesn’t participate in any JR pass. So I can’t use my JR East Pass for the fare. 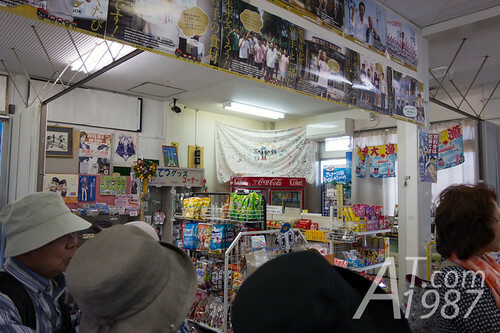 Snacks, beverages, souvenirs and goods from Santetsu’s Tetsudou Musume characters and Amachan are sold inside the station too. 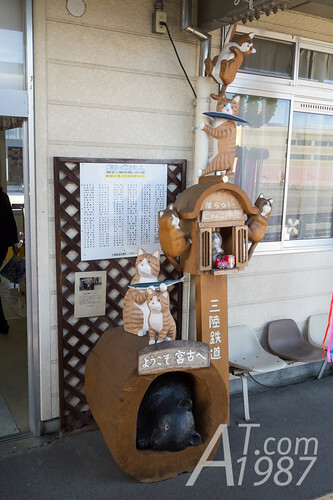 Every Santetsu station have this kind of animal statue at the gate to station building. The statues are different at each stations. Trains normally used on this line are diesel multiple unit (DMU) model 36-100 and 36-200. A different between them is a seat layout. 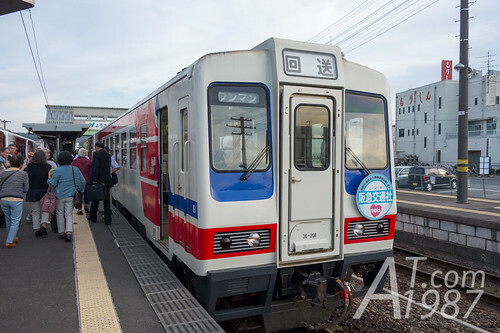 Both models use the same company’s color pattern: blue, red and white which has the following meaning: Sea of Sanriku, Railway Passion and Faithful. I sat in the last car whose number is 300-101. 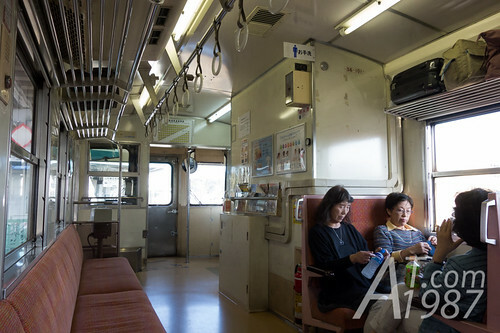 There are seats that face each others and seats beside windows. Then the train left the station.